Yiannis Cottage is situated in a small village in W. Crete, set above Spilia's Myrtidiotissa Church, with it's magnificent painted interior. Indulge yourself around your own beautiful private Pool, listening to bird-song and enjoying the scent of fragrant flowers. We would like to inform you about some changes we have made this year in our property, in order to have better and higher quality stay. We provided some space to young artists to express themselves through art. and vegetables from our garden and fresh eggs from a new small hennery a few meters away from the Cottage.. You can collect vegetables and eggs by yourself!!! With respect to the architecture of the area we have upgraded the facilities of the Cottage giving more emphasis to a larger bathroom & shower area. Yiannis Cottage is provided with the special sign of the Greek Tourist Organization (EOT-1354121504) which secures the quality level of all services, terms and conditions our guests have the privilege to enjoy during their stay. Enjoy the pleasures of the local tavernas, or eat by your Pool on warm balmy evenings. Whether you are looking for a totally relaxing, or a more adventurous holiday, you will find that Yiannis Cottage is the perfect base. Welcome pack. : A welcome pack will await you in the Cottage, consisting of traditional fresh organic products. A bottle of olive oil, raki, and local wine from Yiannis own farm. For you to enjoy leisurely breakfasts on your terrace overlooking the Pool, there is a breakfast pack consisting of bread, natural juices, eggs, bacon, marmalade and butter. Cleaning and linen change. : Also included are bath & Pool towels. The Cottage is cleaned twice a week which includes linen and towel change. Special Discounts : Big Discounts are provided to bookings 3 weeks or more. Send your Requests or book online if you wish!!! If the dates you want to book are already reserved ask for OUR suggestions!!! When you come i will have a list of some tips... Some taverns, some beaches, and more... I could also arrange for you several services. Boatrips. Samaria gorge transfer, sailing, massage, personal training, baby sitting, etc..
Just fabulous as always . Perfect chilling place . Shame the church bells have almost gone . Absolutely fabulous stay from start to finish! The cottage was beautiful a real Cretian home. It was spotlessly clean, exactly as described. The pool and location far exceeded our expectations. Pretty garden, perfect privacy and stunning views of the surrounding mountains. Manolis was a wonderful host and spoilt us. We were left Cretian delicacies, collected eggs from the chickens, and his grandmother made us some gorgeous stuffed vegetable dishes. Manolis also gave us great advice as where to go and visit. We loved the village life attended church on Sunday and we went to both local tavernas which were lovely, fed the local cats, walked to the supermarket and visit the local beach. We absolutely loved it and would highly recommend it. Thank you so much Manolis. Amazing place, full of beauty and calm! I suggest it with all my love! We've just spent 2 weeks in August 2018 on this very pleasant cottage. It is really well located on a small charming village of West North Crete. The cottage is very pleasant with the swimming pool, the trees and lots of flowers, beautifull landscape on the village's Church and the montains. The owner of the cottage, Manolis, is a so so so gentle man !! He takes time to give you good bargains to visit the Island, where to eat local food, and also discuss with you about many things as you do with your own friends ! He brought us so much things to eat and drink when we arrived that was so nice to begin our holidays ! Everything is done to feel good as if you were in your own house : you can take directly fresh eggs from the laying hen, you have to drag flowers to take care about it. Two terraces allows you to eat with sun or not. Thanks again for all to Manolis ! 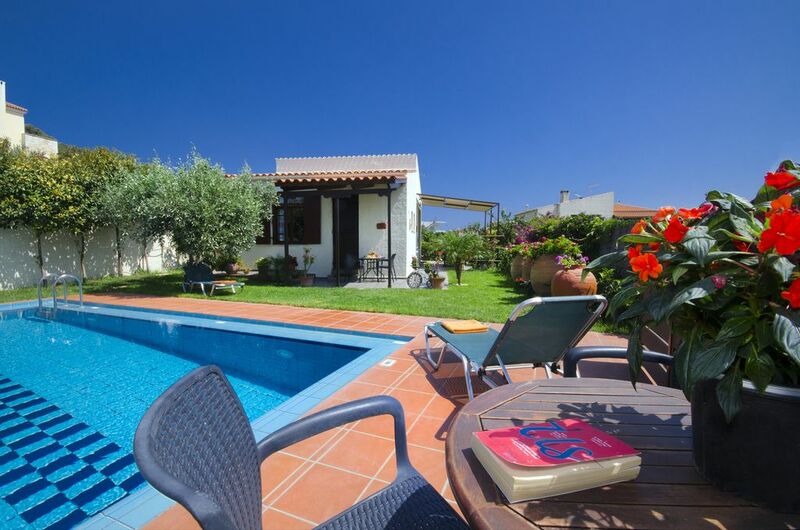 We picked the Yiannis Cottage because of the private pool and beautiful views we saw in the pictures. We were not disappointed! We had a wonderful and relaxing stay here. Manolis was helpful and responsive to anything that we needed. We would definitely recommend! Spila is located on the edge of the plain of Chania 2 km from Kolymvari, 22km from Chania city-centre and 35 km from the airport of Chania. The village is near the junction with the national road which allows access to Chania in less than 20 minutes. Close by, there are 1 small mini market and a bigger one (2 minutes drive) where you will find provisions; fresh bread, fruit and vegetables and indispensable articles. You can also order by phone and the owner of the mini market can bring anything you need at the Cottage!!! The village of Spilia is named after the Cave of Ai-Yiannis Erimiti which is to be found in the west part of the village on the hill above the Villa (1 km away), on an impressive site of great historical importance and exceptional views of the olives groves, the sea and the White Mountains. The Cave of St John the Hermit looks like an oblong arcade. Its length is about 135 meters and the scientists believe that it is essentially a prehistoric river bed. The history of the cave is associated with the ascetic life of the hermit John, since he lived there – according to researchers – in the 6th century. A short distance away from the Villa (100m away) is situated a dense vegetation of extremely high Plane Trees, that are centuries old. Under the trees is a very pleasant and local tavern which offers traditional food. In charming Kolymvari (5 minutes by car) you will find the Iera Moni Gonias Monastery and the Orthodox Academy of Crete. In the village there are many pleasant tavernas, restaurants and kafenions, a post office, a medical center, a supermarket and bank / ATM’s. The area is famous for its fish, landed fresh daily from the harbour, the fragrant wine of the Kissamos area and the awarded olive oil with it’s low acidity rate. Spilia village is ideally located for you to visit the most important coasts of Crete, the well-known Falassarna with the immense sandy beach, the ancient town and the enchanting lagoon of Elafonisi, attractions awarded by international organizations for their clearness and the multi coloured sand formations. In the wider area is set the beautiful lagoon of Balos at Gramvousa where you can enjoy all the tints of blue and green. Night-life, beach bars, wind-surfing and other extreme sports can be found in abundance all in the Platanias area which is not far away. The famous Samaria Gorge, and many other wonderful Gorges & walks in the countryside are another option.